I find myself turning to epicurious more and more often when I have something sitting in the fridge that I just don’t feel inspired by. We had an eggplant from our CSA box hanging out for a few days, and a few minutes at epicurious turned up this recipe from Gourmet Magazine a couple years back. 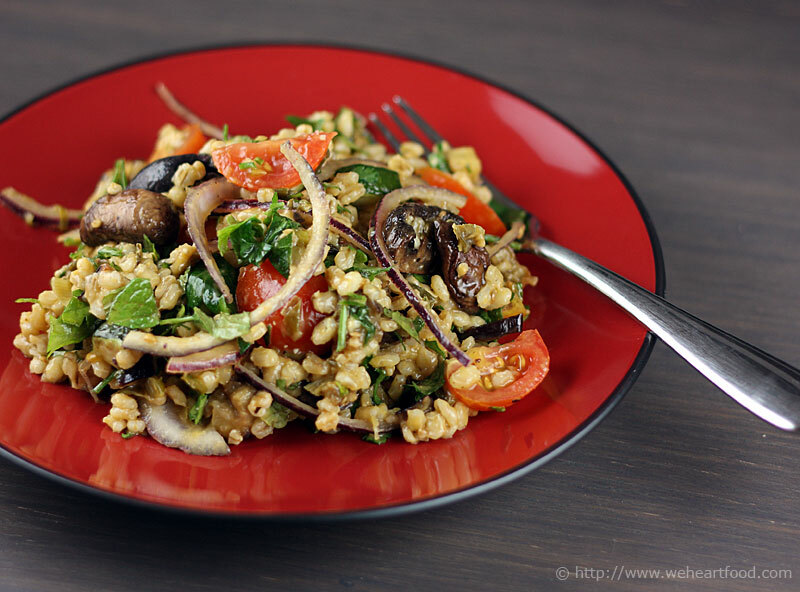 Eggplant, zucchini, and mushrooms are oven roasted and then tossed with barley cooked in stock, green onions, and spices, cooled, and tossed with a lemon vinaigrette. Delicious! I figured out what to make with the eggplant, and it ain’t baba ghanoush… not only that, you’re gonna love it. Why, is it some sort of grain salad with a bunch of veggies? How the — what? Hey! Man, I’m good. Yum — so is this dish! You’re right, I love it. I’m still trying to figure out…. whatever. Yeah — I really like the tomatoes… and I’m glad I threw in those mushrooms, too. That’s good for the blog, too. It missed featuring shrooms. If we didn’t know so many picky eaters, I’d suggest we bring this to parties. Heat 2 tablespoons oil in a 3- to 4-quart heavy pot over moderately high heat until hot, then cook green onions, cumin, coriander, and cayenne, stirring, until fragrant, about 1 minute. Add barley and cook, stirring until well coated with oil, 2 minutes more. Add broth and water and bring to a boil. Reduce heat and simmer, covered, until all of liquid is absorbed and barley is tender, 30 to 40 minutes. Remove from heat and let stand, covered, 5 minutes. Meanwhile, toss eggplant, zucchini, and mushrooms with 5 tablespoons oil, 3/4 teaspoon salt, and 3/4 teaspoon pepper in a bowl, then spread in 2 oiled large shallow (1-inch-deep) baking pans. Roast vegetables in oven, stirring occasionally and switching position of pans halfway through baking, until vegetables are golden brown and tender, 20 to 25 minutes total. Combine vegetables in 1 pan and cool, reserving other pan for cooling barley. Transfer the barley to reserved shallow baking pan and spread to quickly cool, uncovered, to room temperature, about 20 minutes. Whisk together lemon juice, garlic, sugar, and remaining 1/4 teaspoon salt, 1/4 teaspoon pepper, and 3 tablespoons oil in a large bowl. Add barley, roasted vegetables, and remaining ingredients to bowl with dressing and toss until combined well. Eat, eat, eat. This entry was posted on Monday, April 12th, 2010 at 10:54 pm	and is filed under Main Dishes, Mediterranean, Salads and Light Soups, Vegetarian. You can follow any responses to this entry through the RSS 2.0 feed. You can leave a response, or trackback from your own site. Beautiful salad. I love everything about this one! I have been on SUCH a barley kick lately. That’s the only grain I’ve been seriously craving. This looks like one excellent salad! Looks good Chris against that red plate and bet it tastes great too! I am so going to make this one too! I love eggplant when it’s cooked right. You should still bring it to parties regardless!